Somos+, Javier Martinez, DATE — According to the Spanish newspaper El Pais, from its Facebook page, “The Garage of Those Not Going Anywhere,” 94,000 Syrians are on migratory routes to Europe. They are trying to flee the worst civil war that has plagued this Middle Eastern nation. UN estimates show a quarter of a million refugees have fled the country, and another eight million have been displaced from their homes, while Europe, in the first half of the year alone, recevied around 338,000 emigrants. But Syrians are not the only ones today leading such a stampede. 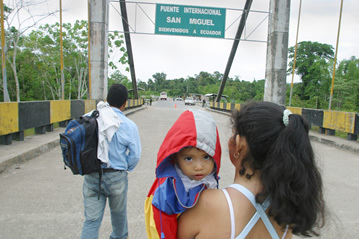 There is a migratory corridor in Latin American which the world media ignores. We don’t know the reasons although what these migrants face in many cases are situations very similar to the Syrians. I am not trying to make comparisons, I hope to make this point clear, but we need to call attention to the thousands of Cubans who are today traveling through Central American countries risking their lives, in subhuman conditions, and without the least support or recognition from the international community. While the Syrians pay between 2,500 and 4,000 euros (approx. $2,700 – $4,300 US), Cubans have to pay between $5,500 and $8,000 US from Ecuador, although at times the price is even higher, depending on the time of the trip and the security displayed by the traffickers. I do not doubt that the Islamic State is a terrorist group, we have seen their videos terrorizing the world, but the Central American gangs are not far behind, in El Salvador, Nicaragua or Costa Rica and even in Mexico. They kill Cubans for that simple fact, of being Cubans. While the Syrians navigate the Mediterranean and in many cases are shipwrecked with lametable lost of human lives, Cubans are held at various border posts in “brother countries,” forced in many cases to strip naked, raped, beaten, and held until their families pay to rescue them. The jungles of the Darien Gap, between Colombia and Panama, where emigrants have to cross on makeshift rafts, are known for excesses, blood and death. A simple variation in the route, a shout a fear, a cry of hunger, and they fall into the lands of narco-traffickers and paramilitaries. The stories are true, told by the survivors who make it to the US. We will never know the exact number of Cubans who have died on the journey to reach the United States from Ecuador. Never. Some disbelievers want to compare wars and government excesses. Clearly the Syrians are facing a national situatuion worse than ours. In Syria you can die from a bomb or a stray buller, in Cuba you die as an old man without political, social or economic freedoms. In the war you can lose your house, your car, your land and your business, and in Cuban you never have any of these things. There are solutions to save the lives of Cuban emigrants. The Cuban government could ask for guarantees for the free passage of its citizens from the Central American countries, could try to establish agreements that would care for and preserve the lives of its emigrants. The same people who, later, with their remittances sent back to Cuba, oxygenate the economy of the system. However, it hasn’t done it, it will not do it, because it would imply recognizing the expiration of a system and of a totalitarian government, that leaves no other options for its citizens, other than escape. Syrians are political refugees and so are we Cubans. There, a dictator governs, and in our country a different dictator governs, who, of course, supports the Syrian dictator. Raul Castro and Bashad al Assad are close friends. People emigrate becuase of the ineffectiveness of their leaders and their rejection of those leaders remaining in power. Although each one faces different consequeences, the cause is the same: the refusal of a man to leave power.